Blogging two days in a row? It's a Christmas miracle!! Well, actually it's more about the fact that I'm waiting while my students finish a 3-hour final and I thought, if I have to be bored, perhaps I can at least relieve any boredom of my readers. So, here's a pretty interesting little ad - actually I have several similar ones, but I'll explain that in a moment. 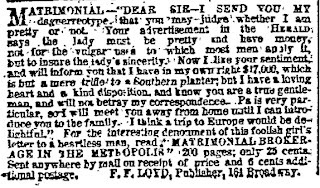 Matrimonial - "Dear Sir, I send you my daguerreotype that you may judge whether I am pretty or not. Your advertisement in the HERALD says the lady must be pretty and have money, not for the vulgar uses to which most men apply it, but to insure the lady's sincerity. Now I like your sentiment, and will inform you that I have in my own right $7,000, which is but a mere trifle to a Southern planter, but I have a loving heart and kind disposition, and I know you are a true gentleman, and will not betray my correspondence. Pa is very particular, so I will meet you away from home until I can introduce you to the family. I think a trip to Europe would be delightful." 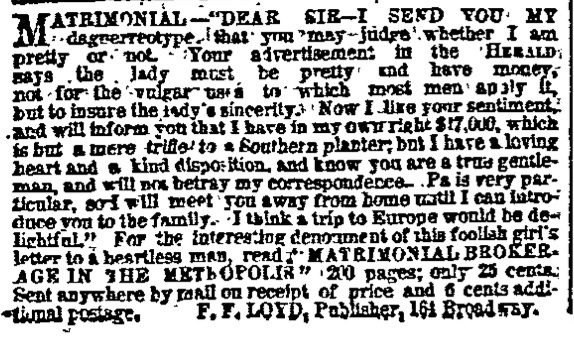 For the interesting denoument of this foolish girl's letter to a heartless man, read "Matrimonial Brokerage in the Metropolis" 200 pages; only 25 cents. Sent anywhere by mail on receipt of price and 6 cents additional postage. F.F. Loyd, Publisher, 164 Broadway. Well, what can you say about this? It's pretty self-evident what's going on here. A very cleverly placed advertisement for a book, I think. Right in the midst of a bunch of ads from apparently sincere gentleman is a warning to foolish young girls who are reading the matrimonials and considering answering them. Pretty modern tactics! These ads appeared not infrequently for about a year-ish, so they must have been pretty successful. Now, I have actually read Matrimonial Brokerage in the Metropolis, believe it or not. It is so bad; I'm not surprised it only cost 25 cents (which of course was worth more than it is today). It's also so obviously fictional. In fact, it's so completely fictional that a woman who was supposedly interviewed by the authors published an affidavit in the New York Times swearing that she was never in the circumstances described by the book. I suppose it's possible she did and then was angry about how she was represented in the book - but it's a pretty extreme measure to lie in a legal document that you have published in a newspaper. And why would she give the interview in the first place, anyway? I didn't end up using this book in my dissertation at all, partly because it just didn't have a whole lot of relevance to the topic I was writing about and ultimately you have to make choices about what you can and can't do in order to graduate in a reasonable amount of time. When (fingers crossed!) I write my book, maybe I'll have the time go back to it. Honestly though, if this book could get published, I should be able to get mine published too...right? As for the letter in this ad...it's another indication to me that it's all a pack of lies. Yes, I frequently think that the people publishing these ads - the young girls in particular - are incredibly foolish. I'd link to some good examples but...I'm really tired right now. However, I can't imagine anyone dumb enough to send a picture, state her exact financial worth, and offer to meet secretly. That being said, there are a lot of stupid people out there so, who knows. In any event, Merry Christmas to those of you who celebrate it! For those who don't, have a great weekend anyway. So, I downloaded Matrimonial Brokerage in the Metropolis from Google Docs (public domain / free) and its hilarious. Thanks for the rec. Yeah, it's pretty funny/awful. Glad to entertain!